Bio-Logix™ Knee Brace is rated 4.6 out of 5 by 16. Rated 5 out of 5 by teagan from amazing bought this about 6 months ago after recovering from surgery.. best brace ive had. works very well! Rated 5 out of 5 by Kenny from A real knee brace If you are in need of a brace beyond a nylon support or slip on, go right to this brace. It is a bit costly but, i could have avoided a couple other lesser quality and less effective purchases. Form fitted and comfortable. I would suggest buying an extra "sleeve" to use while the other is in the laundry. Rated 5 out of 5 by AmoreII from Great knee brace Bought this a month ago and I love it. It support my right knee with easy. I love the sleeve that came with the knee brace. This brace helps me with prevention and when I walking. I have used many different types of braces but this one has been the best brace so far. Rated 5 out of 5 by m2m2 from Exceptional brace. I graduated to the Bio-Logic knee brace and am thankful I found it. Great brace and well constructed. A brace like this would have been very expensive but McDavid has made it affordable! Comfortable fit and provides me confident stability while skiing. Rated 4 out of 5 by Anonymous from Great brace, strong support. Great brace, more than sufficient support. I have a torn meniscus, and the brace has helped immensely. I can bike with not much difficulty, however don't know if it is comfortable in other sports. It has a level 3 support label after all. I think it would be a great improvement if a future model will have only one strap per section. The secondary straps tend to cut circulation off a bit. Rated 5 out of 5 by Rob S. from Best knee brace My son was required to wear the Bio-Logix knee brace by his college lacrosse trainer due to a strain in his ligament. Works great my son said he doesn’t feel anymore discomfort in his knee. Thank you !!!! Rated 5 out of 5 by Daughter of the King from Perfect fit I injured my ligament in my knee and ordered this brace. Amazing comfort, hinge works great, very smooth. 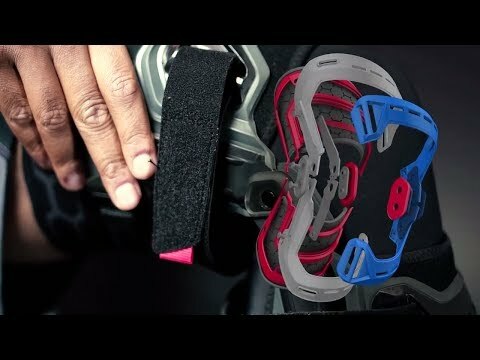 Brace gives perfect pressure and gives me confidence to walk without worry. Highly recommend!